For generations, people have made The Kennebunks their favorite Maine vacation destination. Come to the Kennebunks—Kennebunk, Kennebunkport, and Arundel—and spend your days lounging on beautiful beaches and nights dining in our award-winning restaurants. Or visit one of our historical treasures, like White Columns, the Brick Store Museum, or the Seashore Trolley Museum, then grab some fried clams or the best lobster roll you’ve ever tasted at one of our casual eateries. We even have a new “Lobster Roll Trail of the Kennebunks” guide to help you find your perfect meal! Shop in our unique, independently owned stores, surf, take a boat tour, climb on a stand-up paddleboard, or head out to sea on a whale watch, and then relax in a range of accommodations, from 5-star hotels and elegant B&Bs to homey inns. Filled with a deep sense of history, from the rows of sea captains’ homes to our vibrant museums, yet having a cutting-edge dining scene and upscale resorts, The Kennebunks are a modern escape with timeless appeal. Kennebunk boasts three beautiful beaches—Gooch’s, Middle, and Mother’s. These long, wide, sandy beaches are the perfect place to walk, sun yourself, play in the surf, look for sand dollars, or just enjoy the sight of the waves rolling into shore. In Kennebunkport the three miles of Goose Rocks Beach is a favorite with walkers and the sand pail set. Colony Beach is much appreciated by those who love to scramble on its rocks and watch the surf dash the shore. Enjoy the outdoors, whether it is strolling the serene grounds of St. Anthony’s Franciscan Monastery, kayaking on the Mousam and Kennebunk rivers or walking or mountain biking the trails of the Kennebunkport Conservation Trust—a favorite activity for President George W. Bush. 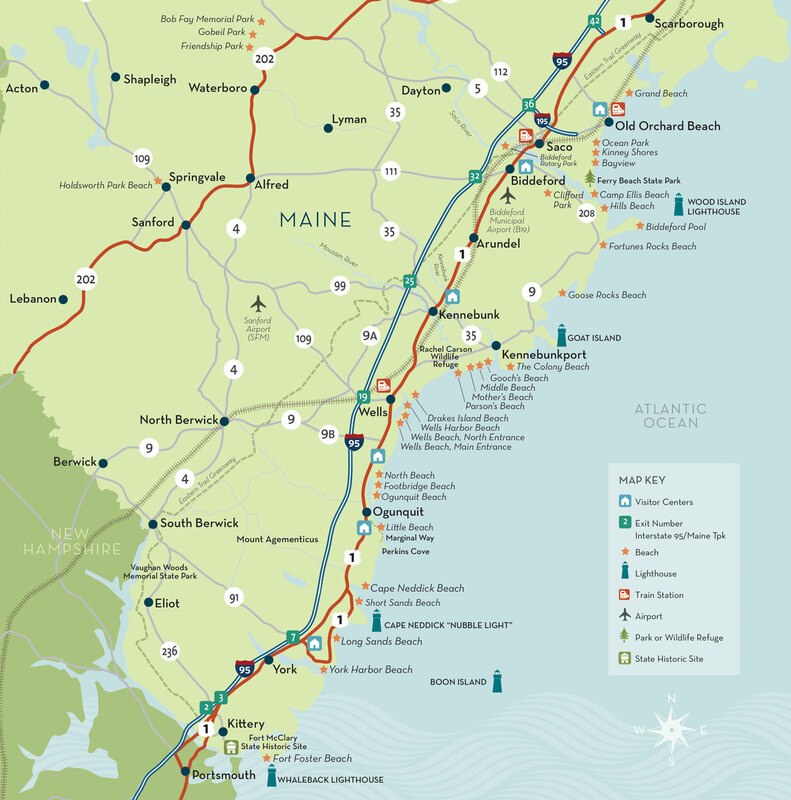 Both Kennebunk and Arundel have entrances to the Eastern Trail—a section of the East Coast Greenway—popular with those seeking to stretch their legs, no matter the season. The Kennebunks are a year-round destination, featuring spectacular fall foliage, the nationally known Christmas Prelude (named the #2 Christmas event in America by HGTV! ), the Paint the Town Red festivities in February, and our Launch! A Maritime Festival returning June 13-17 this year. Isn’t it time you discovered all we have to offer?